Discussion in 'Garden Junk' started by bethie, Jul 25, 2007. There are many recipes for hypertufa. You can use perlite or vermiculite instead of peat. I like this heavy mix, it molds well. Mix dry ingredients well. This can be stored in a container with a lid and used as needed. 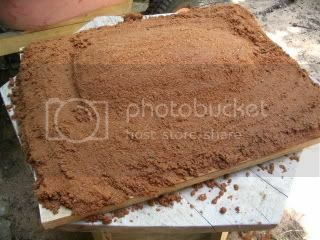 Dump sand on a board and dampen until it will hold it's shape. Don't get it too wet. Shape it larger than your leaf making the middle higher where the water will be. If you don't want a sand edge on your birdbath (I do) cover with plastic wrap or bag. Pick your leaf and cut stem off close but don't cut into the leaf. If you are going to put some color on your leaf have your paint, brush(foam brush is fine) and piece of cardboard handy. 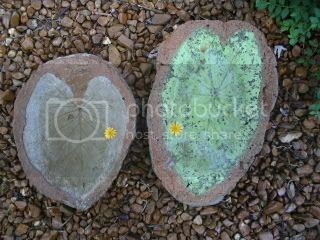 By putting the paint directly on the leaf it will fuse with the concrete and will not peel in the future. Now wet your hypertufa. This needs to be thick to hold it's shape. Always reserve some dry in case you need to patch later. NOW thickly paint your leaf. No neatness needed and lay it over your sand. Now start picking up your hypertufa in double handfuls and lay on your leaf. Wear disposable gloves, of course. Start patting it into shape. Add more as needed. 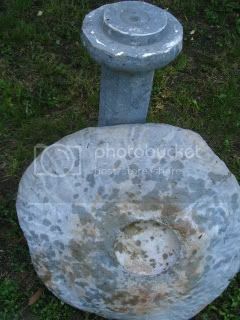 I make my birdbaths thick and have no need to reinforce. 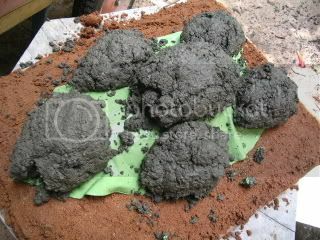 If you want to reinforce use smaller handfuls of Mix, pat into shape, lay down hardware cloth or chicken wire. This doesn't have to be one piece. 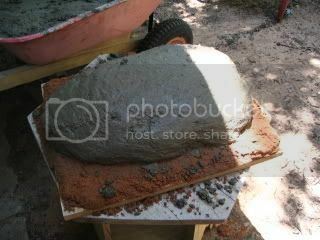 Then add another layer of mix and pat into shape. Along the bottom kind of roll your fingers and tuck the edges in. 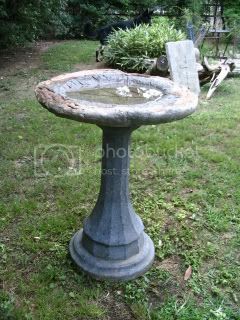 Now is the time if you want to "marry" your birdbath to a pedestal you already have. These are easily found at junkyards. Find a plastic container slightly bigger than the pedestal top. Press it bottom side to the birdbath middle about as deep as the slot on the pedestal.This birdbath is a Queen Paulownia leaf done in gray and then the pedestal was sponge painted in shades of gray. 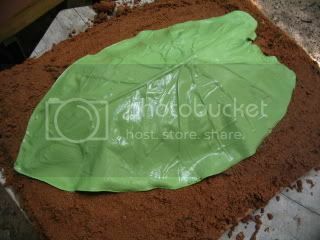 Now let your leaf sit a good 36 hours or more and turn over. Try to grab the leaf middle where the stem was. Sometimes the leaf easily lifts but some times NOT. If it doesn't lift easily. Let it sit another day or so face up in the sun until the leaf is shriveled and the paint is dry. Then you can blast it off with your hose. I let mine dry for a good two weeks in the sun and then I put several coats of Thompson's water seal on it. Then it's good to go. 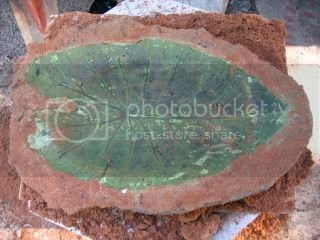 Use same method for leaves that are not birdbaths just make a shallower sand base. I make little tiny leaves for outdoor ashtrays. 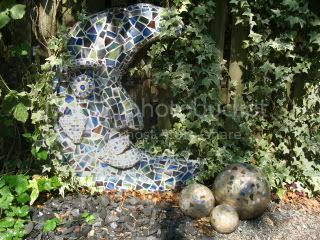 This giant Mr. Moonlight is a whopping 3 feet tall but still EASILY made. I made a pattern and drew it right on a board with a permanent marker. The I cut the pattern down by an inch and a half and traced it with marker on hardware cloth. I cut this out. Then I started puting double handfuls right on the pattern drawn on the board. I patted into shape as I went and made it half the thickness it would be. Then I laid the hardware cloth down and put the rest of the Mix on. Then I used the mix to make him lips, eye, eyebrow and heart on his face. I rolled the edges nice and neat. I took little circles of wire and embedded them here and there right into the edge. He is actually attached onto this fence so he can't be knocked over. His eye is a giant marble. He was cured for several weeks and then glassed. No glass cutting experience needed for this. All the glass was easily cut with mosaic glass cutting pliers. The pieces were glued on with silicone glue. After curing for 48 hours he was grouted with sanded grout. Now the moon always shines here! Think BIG. Congrads on your first green star! I LOVE the moon. You are so inspiring. Mine is still on the burner, if you keep posting pics I will be force to make a special trip to Amarillo for the supplies. Keep making things beautiful. This is marvellously helpful Bethie, I hope it inspires many to make their own leaf birdbath. It's so great to see all the steps laid out in photo form. Have you even entertained the idea of a hypertufa sundial? Just wondering. Wow Bethie, you make it look so easy! A really great tutorial Bethie. your instructions make it look not too scary. I'm still afraid to try it and no where can I find all the supplies .I will just enjoy everyone elses. I love them! They look different from any that I've seen. They had a very cool "fossil" look to them! Great tutorial Bethie and I really love your birdbath. :-D Congratulations on your first star. Thanks a million Bethie. The instructions are great and I can't wait to get started. Could you give more info on the garden lanterns you made as well???? The 'windows' have me a bit puzzled. Keep up the fantastic work - you two are such an inspiration. Thanks for the great instructions and the pictures help a bunch. I have been thinking I might need to break down and actually try this, I want a couple of troughs and I don't see getting them any other way. kjalady, the window is cut out of one piece of an outdoor wood(cypress, redwood etc.) with a jigsaw. The outside of the mold has two screws that go through the mold and come into the window. They are unscrewed when it's time to unmold. Bethie: I think I must be having a blonde moment (it's okay for me to say that - I'm blonde (grin!) ). I just can't picture what you mean. I understand about cutting the window out of wood but I'm afraid after that, I just can't "see it". Help! sorry!!!! Let's see. The mold itself is four pieces of plywood put together with screws on the outside. There is no bottom on the mold, it's just placed on a board. The window is attached to the mold on the inside but the screws attaching it are on the outside going through the mold. The hypertufa is built right around the window itself. When cured, all the screws are removed and your piece is unmolded. Bethie: Okay, I understand most of it. Thank you. But I'm still being a 'little thick' I guess. The plywood is on the outside and then removed when all is set - correct? If so, do you use some kind of 'box' on the inside walls to keep it formed while it is setting, like a box within a box, or what? Usually I can figure out how to make things by looking at them, but this one is driving me a bit batty. Sorry for being so thick on this one. kjlady, the hypertufa is thick and with a little work WILL stand by itself. This is why it is important to not mix all your dry at once. If it won't stand up then add some more dry. The big trough planters are made like this also.